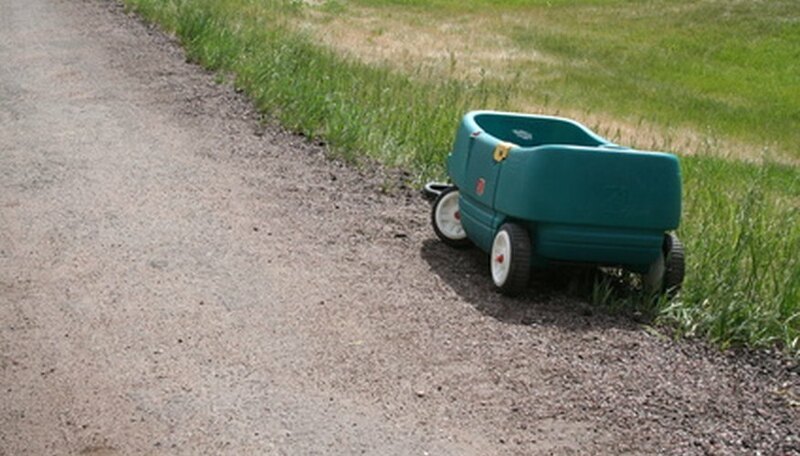 Little Tikes wagon wheels can wear down or break, leaving you with the option of buying a new wagon or replacing the damaged wheel(s). Not surprisingly, the latter option is less expensive. Little Tikes sells replacement wheels for some of their wagons, but, unlike traditional car or bike wheels with visible nuts and bolts, their wagon wheels have a push cap that needs to be removed before you can change the wheels. Many are unfamiliar with removing push caps, but with a little effort, you can fix the toy to make it safe and fun to use again. Turn the wagon on its side so that the wheel you want to change is on top. Stick your paint key or screw driver into the area between the push cap (the cap in the middle of the wheel) and the “hubcap” and dig the blade under the circumference of the push cap, working your way around. Continue going around and digging into the push cap until it pops off. Shimmy your blade under the exposed ring cap and work around it to loosen it, using the same method you used to remove the push cap. When there is enough space between the ring cap and the wheel, use your pliers to twist it off completely. Twist and pull the wheel off the axle and remove it. You can do this with your hands. Firmly push your new wheel onto the axle until it locks. You can purchase replacement wheels by going to the Little Tikes online store, typing in the product keyword for your toy or browsing through the "Riding Toys" category. A link to the replacement parts section of the Little Tikes store is listed in the resource section of this article.